While von Kluck's army was investing Liege and its fortresses, von Buelow's army, 280,000 strong, was advancing up the valley of the Meuse toward Namur. The villagers fled from their homes by thousands at sight of the Huns. On August 12, 1914, the town of Huy, midway between Liege and Namur, was occupied with but slight resistance, giving the Germans control of all the railroad lines. Soon the huge German siege guns, drawn in three parts by teams of forty horses, or by thirteen traction engines, were rolling along the roads to Namur. The defence of Namur consisted of nine detached forts arranged around the confluence of the rivers Meuse and Sambre. These forts were held by a garrison of 26,000 men. The first bomb from the German field guns fell on the roof of the railway station at Namur on August 17, but the actual siege did not begin until August 21, with the arrival of the huge German howitzers, some of sixteen-inch caliber, and throwing projectiles weighing a ton each. On that day thirty batteries concentrated their fire on the Namur forts, smothering them with shells and obliterating the barbed wire defences in the spaces between the forts. The puny armament of the Belgian forts was impotent against this assault. One by one the little six-inch guns were snuffed out under the avalanche of fire from the German batteries, while the armor-plated turrets were reduced to fragments. Throughout four sulphurous days the brave defenders of Namur withstood the attack of 300,000 Germans, living in a veritable inferno after the forts had become untenable, and praying for French assistance that never came ; for the French themselves were hotly engaged with the enemy at Dinant, south of Namur, and could only send two regiments to aid the Belgians. The casualties among the Namur garrison were frightful, whole regiments being decimated. On August 23, Gen. Michel ordered the evacuation of Namur. The garrison, in great disorder, fled from the ruined city, pursued and harassed by the German hordes; and after seven days the 12,000 survivors reacted Rouen, whence they embarked for Havre and Ostend. More than half the garrison had perished in the defence of Namur. 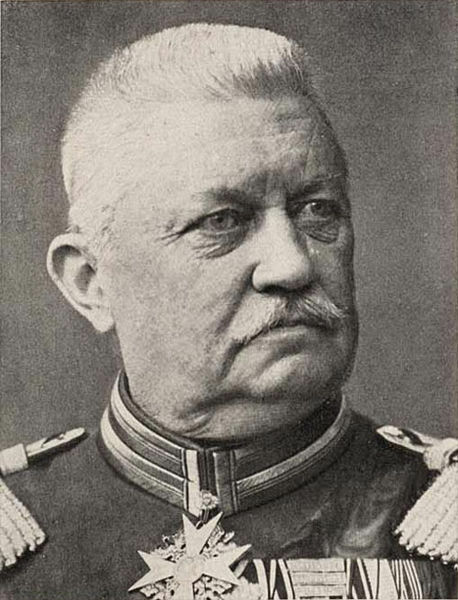 On Monday, August 24, Gen. von Buelow entered Namur with all the arrogance of an Asiatic potentate, accompanied by the military governor of Belgium, Field Marshal von der Goltz. After taking hostages, and dispossessing the citizens of their arms, von Buelow's hordes moved southward, leaving a body of reservists in control of the captured city. Fort Suarlee held out till the 25th, when the garrison of 800 surrendered, and the fort was blown to fragments on the following day. Anticipating the attempt of the French to march to the relief of the beleagured fortress of Namur, the Germans on August 14 had dispatched a division of cavalry, a division of Prussian Guards, several infantry battalions, and a few batteries of light artillery to Dinant, some ten miles south of Namur, hoping to seize the town and head off the French. Though the Germans excelled in numbers, the French made such good use of their "75's" that the bridges over which the Germans had to pass were destroyed and some of the German units were forced into the river. The French guns also played havoc with the German infantry columns. Though the battle was a minor one and undecisive in its results, whatever advantage accrued was credited to the French. 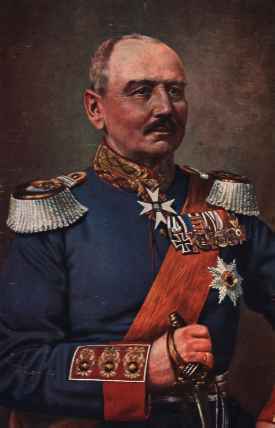 With the outbreak of World War I, Kluck was placed in command of the German First Army. According to the Moltke revisions of the Schlieffen Plan, the First Army was part of the strong right wing and positioned on the outer western edge of the German advance through Belgium and France. This western flank was to advance alongside Karl von Bülow's Second Army to Paris. Upon reaching Paris in concert, the First and Second armies were to threaten Paris from both the west and east.